There really isn’t anything new here. Just the fact that, despite what deniers and the media have been saying, the consensus that human greenhouse gas emissions are causing the climate to warm is getting stronger all the time. However there is a great summary of why we know that it is our GHG emissions, and not something else that is warming the climate. Earth’s surface temperature has clearly risen over the past 100 years, at the same time that human activities have resulted in a sharp increase in CO2 and other GHGs. Both the basic physics of the greenhouse effect and more details calculations dictate that increases in atmospheric GHGs should lead to warming of the earth’s surface and lower atmosphere. The vertical pattern of observed warming –with warming in the bottommost layer of the atmosphere and cooling immediately above- is consistent with warming cased by GHG increases and inconsistent with other possible causes (see bellow). As described above, the climate system varies naturally on a wide range of timescales, but a rigorous statistical evaluation of observed trends, supported by analysis with climate models, indicates that the observed warming, especially the warming since the late 1970s, cannot be attributed to natural variations. Satellite measurements conclusively show that solar output has not increased over the past 30 years, so an increase in energy from the sun cannot be responsible for recent warming. There is evidence that some of the warming observed during the first few decades of the 20th century may have been caused by a slight uptick in solar output, although this conclusion is much less certain. Direct measurements likewise show that the number of cosmic rays, which some scientists have posited might influence cloud formation and hence climate, have neither declined nor increased during the last 30 years. Moreover, a plausible mechanism by which cosmic rays might influence climate has not yet been demonstrated. Based on these and other lines of evidence, the Panel on Advancing the Science of Climate Change –along with an overwhelming majority of climate scientists (Rosenberg et al., 2010)- conclude that much of the observed warming since the start of the 20th century, and most of the warming over the last several decades, can be attributed to human activities. The intriguing thing about using the cumulative emissions approach is that it actually allows for a wide range of policy options. It also focuses the mind on the reality that the sooner we start cutting emissions, the longer we will have before spending the entire budget. Conversely, the later we wait, the steeper the slope of the decline will have to be. 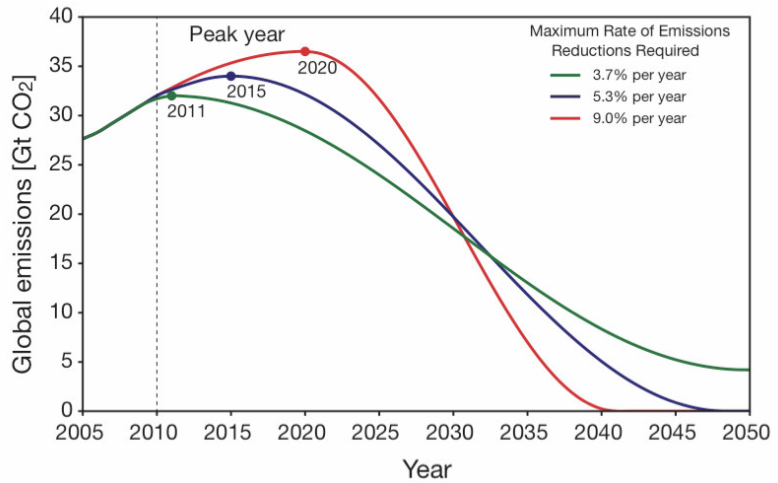 If we wait until the 2020s to start bringing real emissions down, we stand a very slim chance of avoiding catastrophic climate change. But if we start now, cutting at between 2% and 4% a year, things look a bit rosier. That’s not to argue that a 2% annual cut for the next half century will be easy. But it’s certainly not in the realm of the impossible. Let’s hope this approach attracts yet more attention. The bottom line is that the sooner our emissions start to drop the easier it will be to stay below the trillionth tone.